You can fix every street light, fill every pot hole and host the best block parties this side of Mardi Gras, but can any neighborhood truly call itself complete without a big-hearted bike guy? You know the type. Say three kids are out riding bikes while a fourth looks on forlornly. Maybe his or her bike has a busted chain or a hopelessly bent rim. Maybe it was stolen. Maybe a bicycle wasn’t in the family’s budget. On and around West Corning Avenue, that’s an easy one: Anthony Compasso a.k.a. “Biker Ant.” For decades, Anthony, 57, a construction worker, has been the neighborhood go-to guy to get rolling on two-wheels. He never charges for repairs. 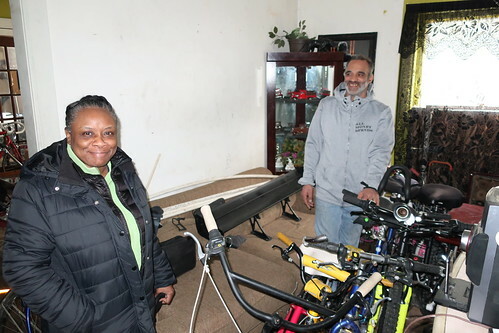 He rarely sells a bike, and when he does, it’s typically to purchase repair parts he can’t cannibalize from one of the dozen or so junkers in his back yard. Anyone who wants a bike has only one threshold to meet: They have to ask. “If you ask me for a bike, it means you don’t have a bike — it’s common sense,” Anthony says. I’ll discuss my cycling velocity profile another time, but for now I’d rather focus on how much Anthony and I have in common. We both love cycling, we both own more bikes than we need and we’re both married to occasional riders who at least appear to have made peace with having their homes transformed into bike storage hangars. Elaine, his wife of 27 years, wins the tolerance prize, though. A hasty census turned up 37 bikes inside the Compasso house. “Those are his toys, so I just leave him to it,” Elaine says, sounding only slightly defeated. Anthony in his home with his patient wife Elaine. I’ve heard the same tone in my home, and there’s a subtext. It goes something like: My husband has a problem that is reflected in the interior design of our home. But there are worse things he could be addicted to than bikes, so can we please just pretend this is normal or better yet not even real? What is real is that Anthony evinces an energetic decency and public-mindedness, qualities that help bring communities together. I first met him last summer while on a bike-fixing errand for Interfaith Works of Central New York, the refugee resettlement agency on James Street. Our client numbers were down in a big way as politicians with hearts the size of hub bearings slowed the flow of legal immigrants to a trickle. But for those who managed to make it here, having a bicycle was often as essential as learning English to being able to function in a new land. My task that day was to get the brakes fixed on a blue Crestline kid’s bike. 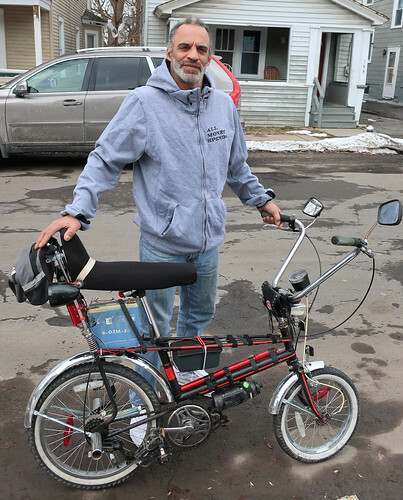 Possessing the mechanical aptitude of a yam, I turned to the undisputed Free Bike King of Syracuse, Jan Maloff, founder of the annual CNY Family Bike Giveaway. He referred me to Anthony, a volunteer mechanic in the long-running program. I dropped off the bike at Anthony’s place, and a few days later he called to tell me it was fixed. Apparently, I got off lucky. Anthony’s usual MO with minor repairs is to fix it in front of kids, taking it apart and supervising as they fix it themselves. It’s a carryover from his experience with a man they called Mean Joe Green. Mean Joe Green (not the football player) fixed appliances and bikes in a shack in the woods of Long Island. Anthony was just 7 years old. He wanted a bike. Mean Joe Green gave him a pile of parts and told him to build one himself. Anthony did just that, and he caught the mechanic bug. “I don’t know why they called him mean — he wasn’t mean,” Anthony recalls of his mentor. There’s a sense of rolling — OK, sprinting — through time and space as Anthony tells the story. Life as one grand, never-ending speed ride. Rey Mercado, 32, a grocery store worker who moved here from New York City three years ago, also met Anthony through Jan. Anthony quickly sized him up as a ride partner, and now Rey is a frequent companion on Anthony’s mad dashes around Onondaga Lake or to Green Lakes State Park. He also works with Anthony to make sure every South Side kid who knows how to ride a bike can experience the same sense of freedom and exhilaration. And so the wrench is passed, from Mean Joe Green to Anthony to Rey. Like Anthony’s beloved Raleigh Chopper, which he has been perfecting since 1970 — 1970! — the one with the amplified sound system and enough lighting to be visible to passing aircraft, the South Side rolls on.